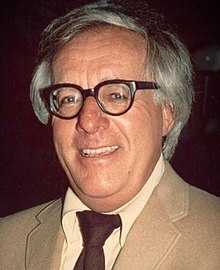 Ray Douglas Bradbury (August 22, 1920 - June 5, 2012) was an American writer. His best known works are The Martian Chronicles and Fahrenheit 451. He is also known for his big collections of short stories such as "Driving Blind". He was born in Waukegan, Illinois to a Swedish mother. He graduated from a high school in Los Angeles, California. Many of his works are based on real life, such as "Dandelion Wine", a book about growing up in small-town Illinois. His other work includes movies, and screenplays. He won many awards. He died in his Los Angeles home. He also wrote the short story "Dark they were and Golden Eyed". This page was last changed on 6 April 2019, at 23:35.